When baking, follow directions. When cooking, go by your own taste. Do you ever have one of those recipes that somehow comes together and you don’t exactly what you did to make it come together or how to replicate it? 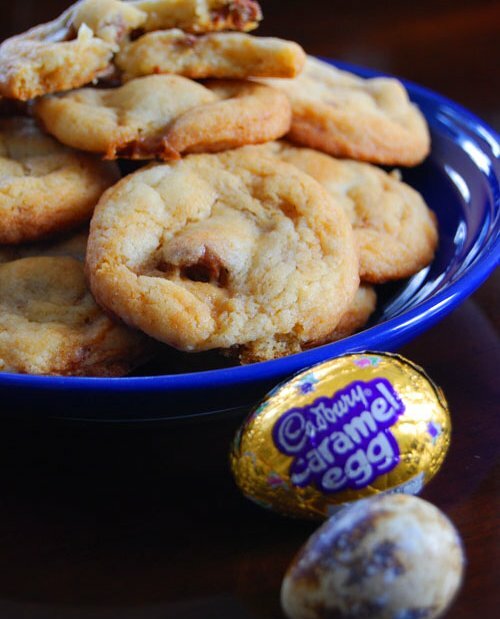 Well it happened with my attempt to make cookies with Cadbury Caramel Eggs — the cousin to the Cadbury Creme Eggs. There was torrential rain in San Diego on Saturday and I even got to see hail fall from the sky. While the rain certainly wasn’t Storm Watch 2010, it was a welcome excuse to futz around and even bake. While I haven’t had any luck with cookies the past few times, this recent attempt almost followed suit. First mistake was deciding to split a sugar cookie recipe in half — bad idea especially when it called for half an egg. While I’m certain we would have eaten all the cookies before the end of the weekend, I really should have gone with making the full batch. Baking tends to be an exact science with measurements. With the split recipe, the dough didn’t seem to come together — maybe it was using a Quail egg instead of half a chicken egg and I had to use a bit of milk to bind the dough together. Breaking apart the caramel eggs and incorporating it into the dough was just a sticky mess — chocolate and caramel everywhere! 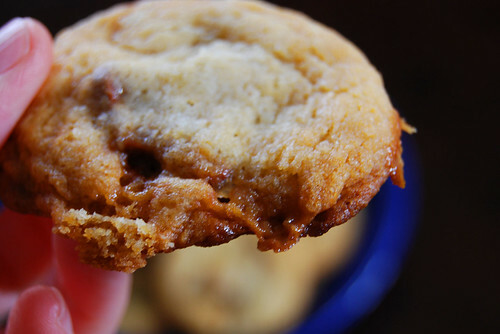 The 8-10 minutes of baking time for the cookies melted the caramel and chocolate, sometimes oozing out of the cookie during the baking process. It turned out pretty well despite the almost-disastrous outcome and the cookies were gone in two days. The pseudo sugar cookie recipe was a nice accompaniment to the sweet and salty tinge of the caramel egg. I do recall reducing the sugar in the recipe quite a bit to compensate for the sweetness of the candy. While I can’t give post the exact recipe for the cookies, I will link to Nigella Lawson’s recipe for deep fried Cadbury Cream Eggs.